2008 Viking Yachts Express Sport Yacht "BIG DADDY" says it all! Custom Viking 52' Hardtop Powered by Twin MAN 1360 HP Common Rail Diesels with Approx. 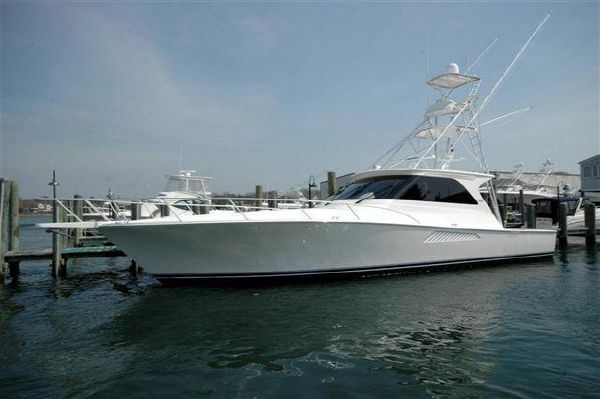 925 hrs, Custom Tuna Tower with Molded Hardtops, Rupp Outriggers, Eskimo Ice Chipper, Livewell, (9) LED Underwaters Lights, Custom Rod Storage Racks in Heads, Evolution Line Cutters, Two staterooms, two heads, a spacious galley and a climate controlled deckhouse. The master stateroom is aft on the port side with the VIP stateroom forward. The master head is uniques with the head relocated inboard and a companionway door delete. The galley features Sub Zeros Undercounter Refrigerator/Freezers and plenty of storage space. The deckhouse features a sliding cabin door, two Stidd helm chairs, an L-shaped sofa and an entertainment center. Visibility is excellent thru-out the entire rpm range. Nice Electronics Package; Furuno MU150 15" LCD Radar/Chartplotter/Fishfinder, Northstar 6100i 15" GPS Color Chartplotter, Furuno 1954C BBNT Radar 1200 WATTS 72 Mi.Open Array Furuno DFF1 1kw Blackbox Fishfinder, Furuno SAT Weather BBWX1, 16' VHF Antennas, Simrad AP26 Autopilot, ACR RCL 100 Remote Spotlight, Icom M-604 VHF Marine Radio, Furuno RD-30 Digital Depth/Speed/Temp Gauge, Compass, KVH SAT TV M5 with 2 Receivers, Tower; Furuno GP1920C Navnet VXII Chartplotter/Radar/Fishfinder and Icom M504 VHF Radio. 1,000 Hour Serviced Performed in July 2015. 2005 Cabo Yachts 40 Flybridge Express "REEL HORIZON" is a very well cared for 2005 40' Cabo Flybridge, which has only been used in the Northeast Waters. Powered with the reliable MAN 730 HP Diesels 990 hrs, Custom Fiberglass Molded Hardtop with full Enclosure, Bow Thruster, Rupp Double Spreader Outriggers with Center Rigger, Custom Teak Ladder Back Helm Chairs, Transom Door and an extensive electronics package to include the following; 10" Northstar 6000i GPS Color Chartplotter, Furuno Navnet 3D Radar/Fishfinder/Chartplotter(2013), 19" and 21"Flat Panel Display for Furuno 3D System (2013), Simrad AP-26 Autopilot, Standard VHF (2013), New VHF Antennas (2013), Icom IC-M604 VHF Marine Radio, Furuno RD-30 Digital Depth/speed/temp, Icom Command MIC in Cockpit, ACR RCL-100 Remote Searchlight and Compass. 1000 Hour Diesel Service performed by Bayside Diesel. Boat and motors surveyed 9/14. Please call for an appointment. 2007 Sea Ray 44 Sundancer JUST TRADED IN! BROKERS ARE WELCOME! 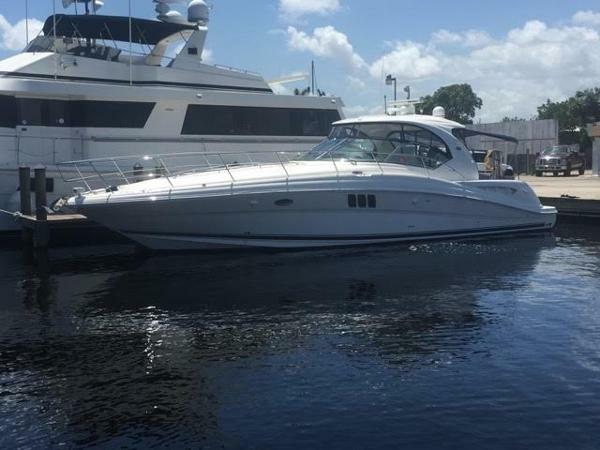 This exceptionally clean and well kept 2007 Sea Ray 44 Sundancer was just fully detailed and is absolutely turn key, ready for its next owner. The boat needs NOTHING. There is not a single button snap missing on this boat or even a single cockpit light out. The gel coat is 9.5/10 perfect, upholstery 10/10 perfect, carpet 9.5/10 perfect, all of the canvas is in perfect condition, you can eat off of the engines or out of the bilge, the bottom is clean and does not need paint any time soon - the boat is ready to go. It is loaded out with under 500 hours AND it is the best priced Sea Ray 44 Sundancer in the world at only $264,900. Powered by twin Cummins QSC 8.3 fresh water cooled diesel inboard engines with 490 hours. Onan 9KW diesel generator White hull and rich cherry wood interior. Large swim platform with transom door and fold out ladder. Full cockpit enclosure 2 full heads with separate shower stalls, vanity sink, and mirrors. KVH Tracvision satellite TV 12v/110v Lighting Multi zone reverse cycle AC/Heat system including cockpit air. Sharp flat screen TV in main salon on power lift with DVD player Samsung TV with DVD player in cabins. Clarion head unit with remote at helm. Foreward deck sunpad Bow thruster Windshield wipers & washers Cockpit refrigerator & freezer Raymarine ST8002 Autopilot Raymarine 72 mile Radar Blue extended bimini top Northstar NS100 VHF Depth finder in GPS & Smartcraft display Rod holders Two burner electric stove Sharp microwave Waeco refrigerator and freezer. Central vacuum 10 Gallon hot water heater Deck shower & so much more, too much to list! 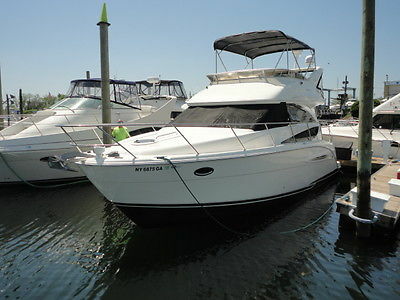 Call now this 44 Sundancer will not disappoint. Now $264,900 - Fully detailed turn-key boat. Must see to believe! The owner spent tens of thousands of dollars maintaining this boat a year and it shows. "Serenity I" offers several features not found on other vessels of her size. These include the two level Master Suite, the Tender Garage for three water toys, the helipad for a light helicopter, a 12 person Jacuzzi and the overall space afforded by her generous beam. 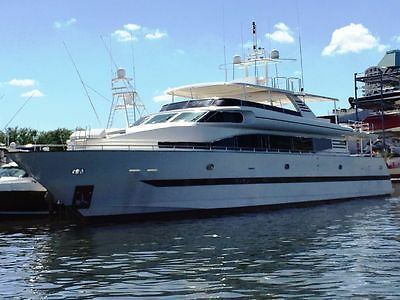 Major Refit in 2011 over $1,000,000 spent at that time and Motor Yacht is currently at boatyard and just received haul out with bottom job and is currently receiving other annual service and updates boat located minutes from Fort Lauderdale International Airport for a easy inspection. "Lets Talk Trades Exotic Clubs,Real Estate,Exotic Cars,RV,Boats,You name it" Please call Mike 954-816-5346 or Gary 561-603-6117 for more info and or schedule a showing.DimensionsLOA: 110 ft 0 inBeam: 22 ft 9 inMaximum Draft: 6 ft 5 inEnginesTotal Power: 3600 HPEngine 1:Engine Brand: Detroit DieselsEngine Hours: Less than 300 SMOHEngine Power: 1800 HPEngine 2:Engine Brand: Detroit DieselsEngine/Fuel Type: DieselEngine Hours: Less than 300 SMOHEngine Power: 1800 HP25KW GEN SET 278.1 HRS SINCE REBUILT35K GEN SET 384.2 HRS SINCE REBUILT Cruising Speed: 23 knotsMaximum Speed: 27 knotsAccommodation: 4 cabins + 1 crew cabin (sleeps 8+3)Vessel Walkthrough Spacious covered Aft Deck with unique exterior access Day Head, open Salon and Dining Salon. On deck Galley with Crew Stateroom adjacent. Unique bi level Master with sauna, Jacuzzi, shower and toilet below decks. Guest accommodations are full beam VIP and two large twin bed guest suites. Large Engine Room with Tender Garage aft. Salon Entering the Aft Deck through twin electric sliding glass doors there is one step down into the expansive Salon. The first thing you will notice is the teak flooring and modern white furniture giving the feeling of a modern vessel, with yacht like touches. The Salon is huge! Twin air trunks in the aft corners form curved walls giving this space an elegant look and feel. To port going forward is a granite topped bar with a hammered nickel bar sink, a hot and cold tap, a Whirlpool Clear Ice ice maker, an under counter bar fridge and three storage drawers. Next forward is a custom six cushion upholstered L shaped sofa to seat six to eight with storage below. A matching upholstered triangle shaped storage ottoman lies in front of the sofa. On the starboard side of the Salon the yacht's entertainment center with 42" Sony Plasma TV and in a cabinet below; a Teac rack system consisting of a Teac AG H300 AM/FM stereo receiver, a Teac AV H500D AV Surround amplifier, a Teac DV H500 DVD player and a Teac PD H570 compact disc multi player. Next forward are two upholstered swivel club chairs with a game table between. Overhead in the Salon is a tray type ceiling treatment with hidden fluorescent lighting. There are 17 overhead mini halogen spots with glass surrounds to diffuse the light. Also in the Salon are Roman shade type valances over the large side windows, five overhead speakers, digital Marine Air AC controls, rope lighting behind the valances and Hunter Douglass Duette shades. Next forward is the formal Dining Area separated by two sycamore columns. Dining Salon Next forward and contiguous with the Salon is the formal Dining Area. Outboard to both port and starboard at the entrance to the Dining Area are curved glass storage cabinets. Each has three shelves of glasses with a mirrored back side and top. The custom table with pedestal base that seats eight is centerline. Each end has an arm chair. All the way forward is a built in curved buffet with a large drawer and four storage cabinets. The top that matches the table works well as a service bar. Overhead is a similar but smaller tray ceiling treatment with fluorescent lights on the perimeter and six overhead halogen mini spots with glass diffusers. There are three other overhead mini spots in the perimeter of the room as well as rope lighting behind the Roman shade type valance with Hunter Douglass Duette shades. Smaller curved panels forward in the corners mirror those found aft in the Salon entry way. The forward bulkhead is mirrored. Two of the side windows slide open. A sliding pocket door separates the Dining Salon form the area forward. Galley The main deck Galley is isolated from the rest of the vessel, yet spacious. The bulkheads and overhead are bright white lacquer. There is a portside pantograph style entry door to the wide walk around side decks offering crew a private entrance. The sole is vinyl tiles in a diamond pattern with Greek key molding trim. The countertops are Corian. The Galley contains the following equipment: Broan compactor Bosch dishwasher Kitchenaid Superba stainless steel oven w/ceramic cook top Large vented exhaust hood Hitachi refrigerator/freezer, 2 doors, 4 drawers Flip up workspace countertop Asko T780 clothes dryer Asko W660 clothes washer GE Profile stainless steel Spacemaker microwave oven w/light below Digital Marine Air AC controls Extra deep sink w/disposal (13) Cabinet doors (8) DrawersMain Companionway Just outside the Galley is the main Companionway with a side deck pantograph door to the starboard side deck, stairs the below deck accommodations, a double door walk in pantry, steps to the Pilothouse, a storage area under the Pilothouse and the entrance to the on deck Master Cabin.Pilothouse The raised Pilothouse offers excellent visibility, for both the captain and guests. An L shaped black leather settee with small table faces forward allowing for guest sightseeing. A large three panel windshield causes need for only two mullions eliminating that boxed in feeling on so many raised Pilothouse yachts. There are large side windows as well. The helm is centerline with a Besenzoni electrically adjusted helm seat. To both port and starboard are storage cabinets and electrical panels behind smoked glass doors. The navigation equipment is in need of a upgrade, and the equipment listed does not reflect if the equipment is actually operational. Furuno FRS 1000 10? screen for radar/plotter, sounder (2) Detroit Diesel electronic display modules (3) Speich variable speed wiper controls Robertson Simrad AP 22 autopilot 63 Mile Furuno radar ? displayed on FRS 1000 screen VDO Logic analog/digital electric compass VDO Logic analog/digital depth gauge VDO Logic analog/digital speed log (4) Weems fuel tank level gauges Naiad bow thruster control Kobelt rudder angle indicator Detroit Diesel electronic clutch/throttle controls Hitachi 17" color monitor for navigation Furuno FM 2510 VHF radio transceiver w/remote mic Raytheon Ray 430 loud hailer w/remote mic Furuno FS 1502 SSB transceiver (2) Sanshin (ACR type) searchlight controls Dell Dimension 2400 computer for navigation Northstar 6000I GPS/plotter Weems water tank level gauge DDEC station active panel DDEC emergency manual control panel Ship Schematic w/(7) bilge pumps, (3) sumps & nav light indicators Windlass controls Horn controls Danforth 7? compass w/chrome binnacle Central vacuum outlet Mastervolt battery charger output indicators & controls Marine Air digital AC controls (5) Overhead halogen mini spots w/glass diffuser (2) Stereo speakers Carpeted sole Four steps to sliding stainless steel Flybridge door w/step lights MB Quart NRA 450 AM/FM/CD player HUGE Master Stateroom The very special Master Stateroom is on deck as an Evan Marshal designed two deck suite. One enters from the starboard side aft. The king size berth is on the aft bulkhead with twin nightstands with two drawers below and columns above. The large upholstered headboard sits upon a mirrored bulkhead with twin sconce type reading lights affixed to the mirror. There are rope lights under the berth. Overhead is a soffit area with fluorescent lights in the margins. To port starting aft is a double settee with storage below. Next forward is a two door curved cabinet with a burl wood top and lacquered edge molding. Both port and starboard are long windows with drapes and rope lights behind the valance. The most unique feature of Serenity I is her two level Master. The space going forward from this vanity has 14? of headroom giving the suite a very wide open feeling. Forward is a vanity with stool and drawer. On top of the burl wood vanity top is a Samsung 17" Synchmaster LCD TV monitor. To starboard are five steps leading down to the mid level area with two large, tall double door hanging locker, a second vanity with stool, two portholes with stainless steel weather covers and drapes plus a free form Lucite hand rail. Master Bath w/ Jacuzzi and Sauna The space afforded by this two level Master is nothing short of amazing. Three curved steps down and aft from the mid level area is a very large space with port and starboard his and her sinks with bow front vanities with storage below, Granite countertops, under mount UFO sinks and Grohe fixtures. Above each sink is a mirrored door medicine cabinet and porthole with drapes. Forward to starboard are three storage cabinets. Forward to port is the separate room for the toilet. Behind the curved entry door are three storage cabinets, a Vacuuflush toilet, an overhead halogen mini spot, an exhaust fan and a Galaxy granite countertop. Aft through a clear glass door and a round glass sidelight is what makes this suite so unique. There is a centerline shower with hand held or wall mounted fixture, a Jaxon two person Jacuzzi tub with lights, blowers, jets and a shower head to port. To starboard is a four person cedar lined genuine sauna with porthole, lights and stereo speakers.Lower Foyer From the starboard side companionway there are nine curved steps with step lights leading to the Lower Foyer. At the base of the steps is a large linen locker followed by twin curved niches with beveled mirrors above and small display shelves below. Aft are two identical twin cabins. Forward is the full beam VIP Cabin.VIP Guest Stateroom Being that the Master Stateroom is on deck, the VIP rivals the space of most other Master Cabins on a yacht of this size. Entering from the rear, the king size berth is centerline with rope lighting below. Behind the berth is an upholstered headboard mounted on a three panel beveled edge mirror with twin sconce type lights that same as reading lights. Either side of the berth are two extra wide nightstands with two drawers each, a burl wood top with lacquered bull nose edging. Each side has a palm tree table lamp. To the starboard side is a half height hanging locker, a full length hanging locker and a two person upholstered settee between with four cabinet doors, two opening portholes above with stainless steel storm covers, drapes and rope lights in the valance and under the settee. Aft is a walk in hanging locker with three large drawers within. Next inboard is a 19? Toshiba TV, an APEX AD 1500 DVD player, a Hughes Direct satellite receiver and three drawers. To port starting forward is a half height hanging locker, a vanity with a flip up burl wood top flanked by two storage cabinets. Above the vanity are four storage cabinets, two portholes with stainless steel weather covers, drapes and rope lighting behind the valance. Next aft is another half height hanging locker followed by the entrance to the VIP Head. Also in this cabin are digital AC controls, a tray ceiling treatment with rope lights, eight overhead halogen mini spots with diffusers and stereo speakers. VIP Stateroom Head Accessed only from the VIP Cabin is the private VIP Head. It is surprisingly spacious. There is one storage cabinet in the vanity below the bow front under mount UFO sink and Galaxy granite countertop. Above is a beveled edge mirrored door, medicine cabinet, a porthole with storm cover, drapes and a fluorescent light behind the soffit. The toilet is a Vacuuflush model. The stall shower has a bi fold clear tempered glass door, a seat, a handheld or wall mounted shower fixture, a light and an exhaust fan. The sole of the shower and the head is Galaxy granite tiles with stainless steel inserts between the tiles. Also in the Head are three overhead mini spots and an AC vent. Starboard Guest Cabin Entering from forward there are two generous width single berths with a free standing two drawer nightstand between. The entire aft bulkhead has a three panel beveled mirror upon which sits a curved upholstered headboard. Each berth has a swing arm reading lamp. A curved lacquered soffit above hides rope accent lighting. Above the outboard berth are four storage cabinet doors with shelves within. Above are two opening portholes with stainless steel weather covers, drapes and rope lights behind the soffit. At the foot of the berth is a large two door hanging locker with shelves within. The forward end of this cabin has the entry door to the en suite head, a built in 17? Toshiba TV and a cabinet below with an RCA Direct TV receiver. Also in this cabin are Marine Air digital AC controls, rope lighting under the berths, five overhead mini spots with light diffusers, stereo speakers and a carpeted sole.Starboard Guest Head Accessed only from the Guest Cabin is the private Guest Head. It is surprisingly spacious. There is one storage cabinet in the vanity below the bow front under mount UFO sink and Galaxy granite countertop. Above is a beveled edge mirrored door, medicine cabinet, a porthole with storm cover, drapes and a fluorescent light behind the soffit. The toilet is a Vacuuflush model. The stall shower has a bi fold clear tempered glass door, a seat, a handheld or wall mounted shower fixture, a light and an exhaust fan. The sole of the shower and the head is Galaxy granite tiles with stainless steel inserts between the tiles. Also in the Head are three overhead mini spots and an AC vent. Port Guest Cabin Entering from forward there are two generous width single berths with a free standing two drawer nightstand between. The entire aft bulkhead has a three panel beveled mirror upon which sits a curved upholstered headboard. Each berth has a swing arm reading lamp. A curved lacquered soffit above hides rope accent lighting. Above the outboard berth are four storage cabinet doors with shelves within. Above are two opening portholes with stainless steel weather covers, drapes and rope lights behind the soffit. At the foot of the berth is a large two door hanging locker with shelves within. The forward end of this cabin has the entry door the en suite head, a built in 17? Toshiba TV and a cabinet below with an RCA Direct TV receiver. There is also an APEX AD 1500 DVD under the SAT receiver. Also in this cabin are Marine Air digital AC controls, rope lighting under the berths, five overhead mini spots with light diffusers, stereo speakers and a carpeted sole.Port Guest Cabin Head Accessed only from the Guest Cabin is the private Guest Head. It is surprisingly spacious. There is one storage cabinet in the vanity below the bow front under mount UFO sink and Galaxy granite countertop. Above is a beveled edge mirrored door, medicine cabinet, a porthole with storm cover, drapes and a fluorescent light behind the soffit. The toilet is a Vacuuflush model. The stall shower has a bi fold clear tempered glass door, a seat, a handheld or wall mounted shower fixture, a light and an exhaust fan. The sole of the shower and the head is Galaxy granite tiles with stainless steel inserts between the tiles. Also in the Head are three overhead mini spots and an AC vent. Crew Cabin The Crew Cabin is accessed directly from the Galley. Inboard are two berths bunk style, each with a reading light and a large storage drawer and rope light below the lower berth. Outboard is a single lower berth also with a large storage drawer and rope lights below. Above the berth is a fixed window with drapes and rope lighting behind the valance, a Toshiba 13? TV/VCR combo and a swing arm reading lamp. Also in this cabin are Marine Air digital AC controls, CDX 3800, a Sony AM/FM/CD player, two stereo speakers, four overhead mini spots and private access to the Crew Head.Crew Cabin Head Accessed only from the Crew Cabin is the Crew Head with a white lacquered vanity with a storage cabinet below and a Galaxy granite counter and an under mount UFO sink with Grohe fixture above. Above are two mirrored medicine cabinet doors. The toilet is a Vacuuflush model. The stall shower has a sliding semi circular door, a hand held or wall mountable fixture, a light and an exhaust fan. This area has three additional storage drawers, two overhead halogen mini spots and a Galaxy granite sole with stainless strips between each tile. Foredeck Raised bulwarks w/varnished teak cap rails Oversized stainless steel handrails on cap rails (4) Bow cleats (2) Fare leads w/rollers (2) Stainless steel 400 lb. anchors w/250? of anchor chain (2) Maxwell 4500 hydraulic deck windlasses w/up & down foot switches (2) Deck pipes w/chain stoppers Fresh water wash down (5) Teak tread ladder steps to bow sun lounge Huge 6 ? 8 person sun lounge bow cushion w/cover Forward hailer horn (14) Side deck DC lights Chain locker access Teak decks Teak step/seat at bow Welded stainless steel bow pennant staff (3) Windshield wipers Blue Textulene windshield cover International navigation lights Freeing ports (3) Port & (3) starboard spring line cleats (10) Overhead side deck DC lights Side deck Engine Room air intake Lockable fuel fill doors Stainless steel window frames (2) Side deck entry gates Starboard side deck Engine Room Pantograph door w/ladder to Engine RoomFlybridge Hatch over steps to Aft Deck Indoor/outdoor carpet over fiberglass deck Removable stainless hoop rails port, starboard and aft (2) Zodiac 8 person life rafts w/hydrostatic release & Sunbrella covers (3) Triconfort Resin sun lounges (2) Market type umbrellas Aluminum tie downs for helicopter Teak flag staff (2) Poly planer speakers facing aft (2) Raritan 20 gallon hot water heaters for hot tub w/waterfall shower (2) Fresh water wash downs (3) Curved L shape settees to seat four people each w/new cushions & storage below, all three w/height adjustable fiberglass tables 12 person 9? x 13? fiberglass Jacuzzi w/(2) fills over 20 jets & splash lip on the perimeter of tub (6) Storage cabinet doors port (6) Storage cabinet doors starboard Walk behind bar w/stainless sink, (3) storage cabinets, drawer type drink refrigerator Miele electric BBQ grill Miele Ceran electric cook top Sliding stainless steel entry door to Pilothouse (2) Three teak step ladders to hot tub (2) Triconfort resin chairs w/new cushions (4) Triconfort foot stools Seven teak & stainless steps to raised Helm Fiberglass arch w/hardtop over Jacuzzi (2) Speakers at hot tub area Flybridge Crowsnest Helm This area is raised high above the Flybridge deck creating a true "Flying Bridge"Double upholstered helm chair w/height adjustment Helm cover (12) Fixed hoop rails around perimeters Fiberglass non skid deck Raised antenna platform w/(2) KVH SAT domes, TV & telephone, (2) ACR type searchlights, 4? open array radar antenna, horn, etc. 406 EPIRB Furuno FRS 1000 10? screen for radar, plotter, sounder VDO Logic digital/analog depth VDO Logic digital/analog speed log VDO Logic digital/analog electric compass Raytheon Ray 430 hailer Naiad bow thruster controls Kobelt rudder angle indicator Windlass controls Start stop controls Detroit Diesel ECM?s Detroit Diesel electronic clutch & throttle controls Northstar 6000I GPS/plotter Robertson/Simrad AP22 autopilot control Standard Horizon Quest VHF w/remote speaker (2) Searchlight controls Danforth 4? compass Stainless steel helm wheel DDEC Station active panel Aft Deck Teak sole (4) Stern cleats (2) Fare leads w/rollers (2) Maxwell 3500 electric warping windlass w/foot switches (6) Stainless steel support columns for helicopter pad (11) Overhead DC lights Center walk through transom door (2) Built in seats aft for three people each w/new cushions & storage below Port & starboard side boarding gates Teak table for eight w/teak folding chairs & new cushions Aft Deck stereo speakers Teak cap rails on raised bulwark Stainless steel railings on teak cap rails (8) Curved molded teak tread steps to Flybridge Aft Deck controls w/start/stop, throttles & clutches w/Naiad bow thruster control Aft Deck LCD TV ? 17? Stainless steel sliding electric entry door Day Head from Aft Deck w/sink, Vacuuflush toilet & Galaxy granite sole w/countertop (2) Life rings Seven step Marquipt Tide Ride ladder Engine Room Marine Air 180,000 BTU 3 compressor chilled water air conditioning system Naiad hydraulic bow thruster Fireboy MA2 1275 fixed FM 200 fire control system Oil transfer system Kobelt steering system 50 Gallon waste oil tank 50 Gallon fresh lube oil tank Sea Recovery 800 GPD water maker (8) Walker air sep crankcase ventilation system Engine Room sound insulation Detroit Diesel 332 GV transmissions ratio 2.04:1 (2) 110V Engine Room blowers (2) 24V Engine Room blowers (2) Mounted Craftsman tool boxes (2) Triple Racor 1000 fuel filters each engine (2) Racor 500 filters for generators (2) Intake strainers for each engine Total of (8) Raritan 20 gallon hot water heaters 110V Fluorescent Engine Room lighting 12V Incandescent Engine Room lighting Engine Room closed circuit camera Six step ladder to emergency hatch to Salon (2) CRS 300 coolant recovery bottles for main engines Hydraulic steering pump off starboard engine Denison hydraulic pump off port engine for thruster & forward windlasses ?Sturdy? clutch & throttle actuators 24V Fuel transfer pump Audio/visual alarm for FM 200 fire suppressant release Hydraulic oil storage tank Nutone central vacuum system (2) Generator exhaust gas separators Rexon air compressor 110V Supply & return temp gauges for AC plus discharge pressure gauge Engine Room access from starboard side deck via 8 teak tread curved ladder Engine Room access from two doors into tender garage Fresh water spigot in Engine Room Four point Leeson oil change system 3 ½" Shafts Main propellers 42" x 32" 4 blades Excelsior manual bilge pump (7) Bilge pumps (3) Sump pumps Electrical System 12V 24V DC electrical system 110V, 220V AC electrical system Onan 25kW generator in sound shield, 5300 hrs. Onan 35 kW generator in sound shield, 7168 hrs. (28) 8D batteries for starting, house systems, etc. 50 KVA isolation transformer (8) Guest battery switches in Engine Room 220V outlet in Engine Room (2) Vanner 60 amp battery equalizers (2) Mastervolt 24V 100 amp charging systems (1) Mastervolt 12V 100 amp charging system Mastervolt 24/4500 inverter Mastervolt 24/12 DC/DC converter Much of the electrical equipment including batteries are in the hold area under the Tender Garage (2) 100 amp power inlets in Tender Garage (2) 50 amp power inlets at transom TV/Telephone inlet at transom w/cords (2) 100 amp 220V amp shore cords (2) 50 amp 220V amp shore cords (2) 220 volt panels in Pilothouse (2) 110 volt panels in Pilothouse (4) Digital AC volt meters (4) Digital AC amp meters DC volt meter w/(4) bank selectors at Pilothouse panel DC amp meter w/(4) bank selectors at Pilothouse panel Guest battery selector switch at Pilothouse panel (2) Generator start stops at Pilothouse electrical panel Sump tank level indicator at Pilothouse electrical panel Holding tank level indicator at Pilothouse electrical panel Tender Garage (3) Freezer drawers (4) Storage cabinets (2) Rule Jet Ski electric retrieval winches Rule tender electric retrieval winch (2) Stainless steel portholes w/weather covers (2) Jet Ski roller systems Tender roller system (No Jet tender in inventory) Hydraulic transom door (full width) Deck drains in Tender Garage for wash downs Five step teak tread removable ladder between Tender Garage & Aft DeckRemarks CONSTRUCTION DETAILS: Of special note is the vessel's gross tonnage, 180,000 gross tons. Arguably the most boat one will find for the money when age, construction and amenities are considered. "Serenity I" offers several features not found on other vessels of her size. These include the two level Master Suite, the Tender Garage for three water toys, the helipad for a light helicopter, a 12 person Jacuzzi and the overall space afforded by her generous beam. Owners have priced this yacht for a quick sale. Please call Mike 954-816-5346 or Gary 561-603-6117 for more info and or schedule a showing.Disclaimer The Company offers the details of this vessel in good faith but cannot guarantee or warrant the accuracy of this information nor warrant the condition of the vessel. A buyer should instruct his agents, or his surveyors, to investigate such details as the buyer desires validated. This vessel is offered subject to prior sale, price change, or withdrawal without notice. Engine hours are as of the date of the original listing and are a representation of what the listing broker is told by the owner and/or actual reading of the engine hour meters. The broker cannot guarantee the true hours. It is the responsibility of the purchaser and/or his agent to verify engine hours, warranties implied or otherwise and major overhauls as well as all other representations noted on the listing brochure.